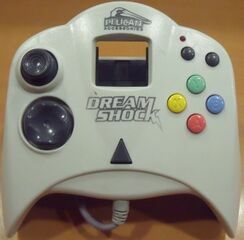 The Dream Shock by Pelican Accessories (not to be confused with the Dreamshock by Vibro) is a third-party controller for the Sega Dreamcast. It is a fairly standard control pad with some programming capabilities. It has built in rumble, eliminating the need for a Jump Pack. It came in at least two colours - white and purple. Variants by other companies have also been spotted - the story behind their existence being unclear at this stage.